Visit Surfer's Paradise Beach and Kirra Beach for some beach relaxation. Step out of Gold Coast to go to Caloundra and see Moffat Beach, which is approximately 1h 35 min away. Next up on the itinerary: enjoy the sand and surf at Burleigh Heads Beach, cruise along Captain Cook Highway, tour the pleasant surroundings at Coolangatta Beach, and buy something for everyone on your list at Marina Mirage. To see ratings, other places to visit, where to stay, and more tourist information, refer to the Gold Coast trip planner. 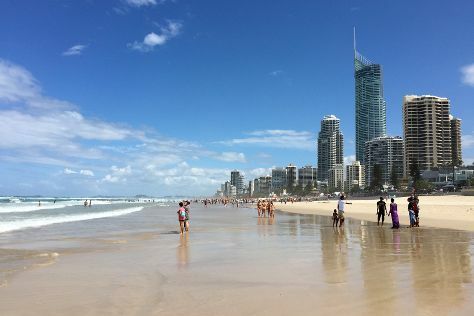 December in Gold Coast sees daily highs of 32°C and lows of 22°C at night. Cap off your sightseeing on the 26th (Wed) early enough to travel back home.